Happy Candlemas and Groundhog Day! The winter-blooming snowdrops may be pushing up from the cold ground in England about now, and we are at the halfway point between the shortest day of the year and the March equinox. Light is returning to the world, and slowly but surely we turn toward spring. And the religious calendar turns also. There are few places in the world where Candlemas is still celebrated on February 2nd– Americans are far likelier to think of today as Groundhog Day (same principle, though)– but the Ripon Cathedral is one of those glorious places where the holiday is remembered. 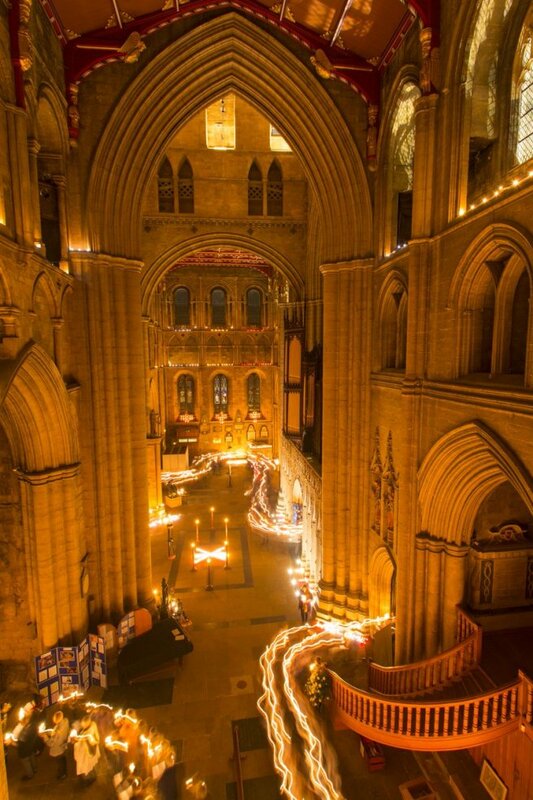 The cathedral is lit with thousands of candles, and candles only, and a processional service takes place in the evening. Re-blogging this from the wonderful Mark Sunderland, who takes amazing photos of Yorkshire. These Christmas photos feature my one-time home of Ripon and neighboring Harrogate. They put me in a festive mood! Merry Christmas, everyone! I’ve been out and about locally adding a few new Christmassy images , which may make an appearance in my 2020 range of calendars! Montpellier Hill in Harrogate was looking particulatly pretty this year with white lights across the entrance to Montpellier Mews and Christmas trees in the shop windows. I prefer to shoot my Christmas images at dusk so that there’s a nice “blue hour” sky rather than later in the evening when the sky looks black. The sky always looks lovely, but at this time of year dusk means around 4pm so it’s also very busy so it can be quite time consuming to get a few decent images! Ebenezer Scrooge– his story is synonymous with Christmas these days, his changed fate is the stuff of redemption stories (“Christ was born for this” to be sure), and his hauntings both thrill our narrative nerves and warn us of our own shortcomings. Most of us roll our eyes when A Christmas Carol comes on TV for the umpteenth time in the wind up to Christmas, but it’s a tale well told and it probably deserves its stature as a holiday classic. Charles Dickens had a well tuned sensibility about what made for a good tale. But how funny would it be if this Christmas tale of his was founded on a misunderstanding? What if Ebenezer Scrooge was birthed by a mistake, a misplaced letter, and an imagination that barreled full speed ahead? It’s said that Charles Dickens kept a diary. And that diary kept a secret about A Christmas Carol, which was published in 1843. While in Edinburgh in 1841, Dickens took a stroll through Canongate Churchyard (or Kirkyard, as the locals would say). It was evening and the light was dimming. He paused at the tombstone of an Ebenezer Scroggie (1792-1836) and mused at the inscription “A Mean Man.” What horrible person had this Ebenezer been, that his epitaph would be so harsh? Not only did Dickens note this in his diary, but clearly he puzzled it over to the point that Ebenezer Scrooge was born and fully fleshed out in a tale that would delve into that miserly past but offer a redemptive future, if only Scrooge would take it. Poor, mean old Scroggie could finally be redeemed. Except that, as the kirkyard tale goes, Scroggie wasn’t a mean man. In fact, by some reports he was quite the bon vivant. Scroggie, who was a vintner and corn/grain merchant, was actualy a Meal Man. Dickens needed better glasses. You can’t verify this story, I’m afraid. Scroggie’s grave marker was removed in 1932, during kirkyard redevelopment. However, you can read more about Dickens and Scroggie here. If you find yourself in Edinburgh, you can enjoy your own stroll through Canongate Kirk and Kirkyard. It’s quite a beautiful church on the Royal Mile, close to the Houses of Parliament and Holyrood Palace. Back in September, I found myself strolling the Royal Mile and happened into the church. It was a slow day, and a young docent was eager to bend my ear about the bright and beautiful space. Interestingly, the space is especially bright and beautiful because of it’s sad past. The church was built in 1690, with a Dutch gable to the façade. It’s simple and elegant, and just a little different from everything around it in Edinburgh. The interior was to be refurbished in the late 1930’s, but WWII intervened and a war time of belt tightening and serious endeavors put that on hold temporarily. In December of 1945 the work was started, and it was finished in 1952. This is significant because, according to the docent, it changed the tone of the work done. The parish, as the United Kingdom, had suffered and lost much during the war. The number of young soldiers who did not return home was a wound that would be long in healing. And so the decision was made that the interior space must be light and bright, must be cheerful and uplifting– a reminder that, though sorrow was heavy, the world was a beautiful place and this was a space for rejoicing as much as grieving. Still today, the interior of the church uplifts. To me, it has a nautical sensibility, at least in its coloring (though it’s possible that I’m influenced by the sea gull cries that are heard over the skies of Edinburgh– a constant subliminal reminder that you are in a port town nestled by the North Sea). If you find yourself in Edinburgh, it’s worth your time to take a peek into Canongate Kirk. I guarantee that you won’t leave saying “Ba Humbug”! 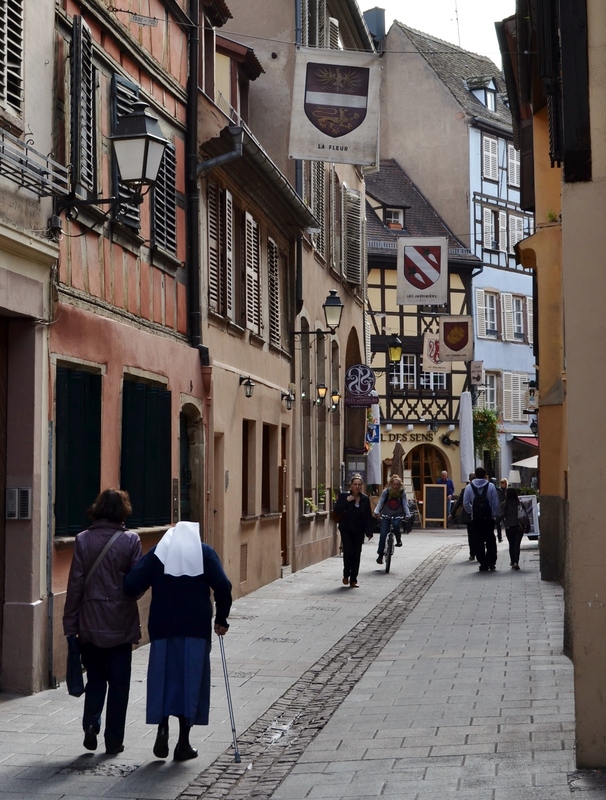 On the border of France and Germany, in the enchanting region of Alsace, sits the ancient town of Strasbourg. She’s the sort of beauty that can bring tears to your eyes– really. The ancient cathedral that pops up like a startled giant as you turn the corner of a tight, wending alley; the rustic half-timbered houses that are painted in cheery colors as a brace against the moody fog of winter mornings in Europe; the myriad small, exquisite restaurants nestled into the tiny crannies of the old town; and the thriving modern art that pulses of youth and energy. This is the town of Strasbourg to me. A fairytale town, both in and out of time– existing somehow as a real, brick and mortar (or wattle and daub) city, but also, so clearly, a space of literal enchantment where you are transported back to a different time, a different world, both fabulous and fierce. And this is one of the reasons why the terror attack this past week, on the edge of the Strasbourg Christmas market, strikes hard with a poignancy and earthy tragedy. It shouldn’t happen in such a beautiful place. Senseless violence in a fairytale city. It shouldn’t happen. But it has happened before in this place and others of its ilk. Because what is the stuff of fairytales, anyway? Dire cruelty always runs through their marrow: just after the achingly beautiful characters capture our hearts, just before we convince ourselves that there is a happily ever after, we get to the bones of the story. And, there at the core, we find violence, malevolence, jealousy. Ugliness. 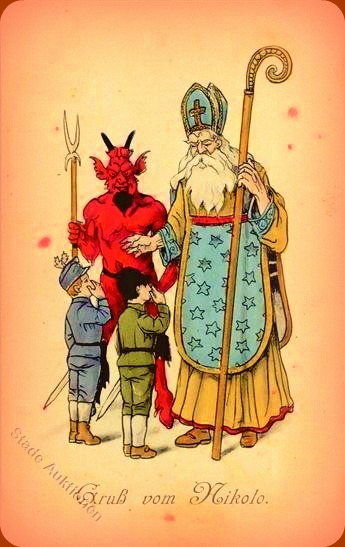 What I can’t decide today, my heart aching for Strasbourg (and for all of us in a world marred by cruelty), is whether this fairytale cycle of ugliness and hope, of cruelty and resilience, lifts me up in a moment of sadness or deflates my sense that our better angels will ever truly win out. All I know is, while hope doesn’t prevent the ugliness, the cut to the bone, it refuses to end the narrative there. 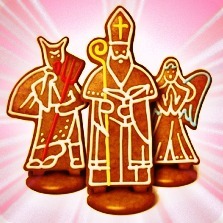 Today is Nicholastag (St. Nicholas Day)! I hope you’ve been good this year and woke up to find candies in your boot and not switches (or worse, Krampus at your door)! 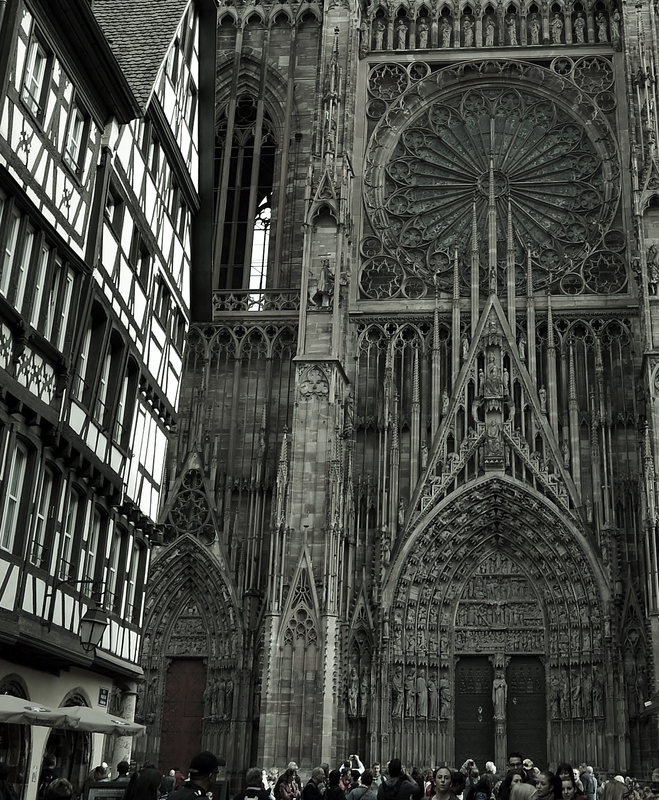 You need only scratch the surface of modern Europe to see the pulsing of its medieval veins. This can be a little unnerving, but it’s also deeply gratifying in a way that’s hard to pin down. Take Christmas traditions as an example. In America, we embrace a jovial, generous Santa Claus (who, for all of his good character points, does seem to team up with Coca Cola, Hollywood, and the rest of the commercial establishment a little too often for comfort). He surrounds himself with other agreeable characters– Rudolph and Frosty–and they have a jolly time. Sure, adversity must be overcome, but their stories never really cross to the dark side. Would you like a little saccharin with that sweet?